Edit: Jay Glazer reporting that Amendola suffered a posterior dislocation at the SC joint. That injury is usually seen in car accidents and other more significantly traumatic events. More on that tomorrow. I initially questioned Jason LaCanfora’s tweet that Danny Amendola would need more imaging on Friday to better define his shoulder injury. Generally, a plain x-ray clearly shows a fracture to the clavicle and that appeared to be the working (and most likely) diagnosis soon after the injury. 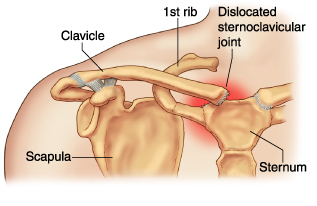 However, the follow up report that Amendola suffered a sternoclavicular joint separation backed up LaCanfora’s tweet. Though the Rams’ team officials would have been able to diagnose the injury without the additional imaging – the appearance of his shoulder and lack of clavicle fracture on x-ray would have strongly suggested an SC joint injury – and in fact reportedly reduced the dislocation in the locker room, CT and MRI are needed to rule out other fractures in the area and define any ligament damage to the joint. Like any joint, there are grades of injury to consider. A dislocation doesn’t necessarily mean that all associated ligaments are torn, but is usually a high grade injury that raises the risk of long term instability in the joint. It’s a good sign that Amendola’s injury was able to be reduced in the locker room, but most sources suggest between four and six weeks of immobilization before beginning rehabilitation exercises with the elbow and shoulder. So, while the six week return to play estimate reported last week is possible, it’s – as always – on the optimistic side of expectations. There’s also a long term risk of decreased range of motion and arthritis in the joint or some residual instability and risk of another dislocation. We’ve seen Amendola push hard to return early from a dislocated elbow in the past, so expect to hear reports that he’s ahead of schedule and doing everything he can to return in 5-6 weeks. But it’ll be surprising to see him return sooner than 6-8 weeks.